When bus accidents occur, it is often pedestrians, bicyclists and passengers in other vehicles who suffer injury or death. For instance, in 2009, 45 bus occupants died in crashes, compared to 251 passenger car deaths for every 100,000 accidents. Only about 4 percent of bus drivers are charged with crimes like reckless endangerment, DWI, DUI, speeding, drowsy driving, or cell phone use. Even so, every case deserves to be examined thoroughly to determine liability and hold negligent drivers accountable. Every year, more than 241 million people take trips on charter and tour buses. In addition, there are limo buses, school buses, and city metro buses that haul people in a commercial capacity. Statistically speaking, buses are more likely to be involved in fatal accidents, according to a 2011 report by the National Transportation Safety Board. Whether the bus accident occurred in Lewiston, Portland, Bangor, or elsewhere in Maine, whoever is determined to be at fault should be held rightfully liable for damages and injuries. That is the way the law is written in “At-Fault” states like Maine. However, it’s not always so cut-and-dry. Often, parties try to shirk their responsibility and lie or deny their way out of liability. When your injuries are severe, filing a car accident lawsuit may be your best recourse. Hiring a specialized bus accident attorney from Hardy, Wolf & Downing will ensure that your case is taken seriously and proceeds through the system in a timely manner. The University of Maine women’s basketball team was involved in a February 2013 bus accident that made national headlines. Freshman guard Milica Mitrovic broke her hand and head coach Richard Barron was treated for face lacerations resulting from the crash, but the team fared surprisingly well, considering the bus crossed a median and went down a snowy embankment into a wooded area. It turns out, the driver suffered a medical condition and was not charged with recklessness. Unfortunately, not all bus accidents end so fortunately. For those who suffer serious injuries, consultation with a seasoned car accident attorney may reveal legal options that can lead to compensation. 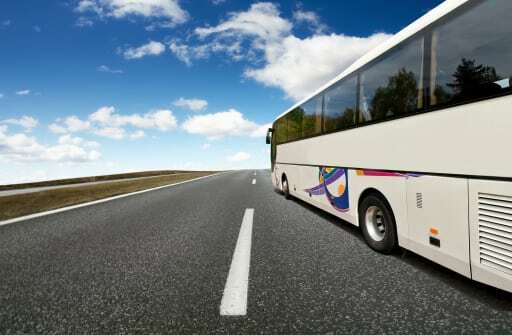 Generally, people do not file bus accident lawsuits over scratches and bruises. Victims may be entitled to compensation that covers past, present and future medical expenses, as well as emotional pain and suffering. Wrongful death bus accident lawsuits may also cover funeral expenses. It is not unusual for plaintiffs to receive tens of thousands in settlement money or jury awards. Statute of Limitations – For most cases, you have up to six years to file a personal injury lawsuit following a bus accident. However, if your accident involved a government or city bus, you have up to 180 days to file. Comparative Fault: You can recover damages from any party that is more at-fault than yourself, but your recovery may be reduced by the percentage you are determined liable. Definition of “Bus”: A bus is any motor vehicle carrying 10 or more passengers. Distracted Driving: In Maine, it is illegal for a bus driver to text or use a phone while driving. Damage Caps: Maine caps non-economic damages in wrongful death cases at $500,000. The law can be complex in bus accident cases, particularly when city or government employees are involved. Skilled attorneys understand how to investigate these cases to get all the facts surrounding an accident and a driver’s past. They can uncover issues in bus maintenance or chronic bus company shortcomings that the average person may not be able to access. Many accident victims feel alone in their quest for justice, buried beneath mounds of medical bills. Never underestimate the value of a sympathetic ear and having someone simply say, “We’ll take care of everything for you.” At Hardy, Wolf & Downing, our clients can focus on recovery and moving ahead with life, knowing that all the details of their case have been put into the hands of a winning legal team. The law firm of Hardy, Wolf & Downing opened its doors in 1976, specializing in personal injury law, including car, taxi, motorcycle and bus accident lawsuits. You can call 1-800-INJURED for a free consultation with one of our qualified and friendly attorneys. You only pay for our legal services if we take your case and you win compensation. Our offices are conveniently in Portland and Lewiston, where we serve residents throughout Central and Southern Maine.